We’d love your help. Let us know what’s wrong with this preview of Duncan, the Story Dragon by Amanda Driscoll. A charming story about the joys of reading that is perfect for fans of Dog Loves Books and Stellaluna. Duncan the Dragon loves to read. When he reads a story, his imagination catches fire! Unfortunately…so does his book. Fire breath is great for roasting marshmallows, but it’s not so great for reading. Duncan just wants to get to those two wonderful words, like the last sip A charming story about the joys of reading that is perfect for fans of Dog Loves Books and Stellaluna. Fire breath is great for roasting marshmallows, but it’s not so great for reading. Duncan just wants to get to those two wonderful words, like the last sip of a chocolate milk shake: The End. Will he ever find out how the story ends? To ask other readers questions about Duncan, the Story Dragon, please sign up. Right from the cover — featuring an adorable dragon sporting classic Chuck Taylor Converses (shoelaces untied, naturally!) — readers can tell what a special treat they have in store with Duncan the Story Dragon. “When Duncan read a book, the story came to life … and his imagination caught fire. Unfortunately, so did his book.” Booklovers of every age will love finding out how this fellow bibliophile solves his dilemma. Highly, highly recommended because fine children’s books aren’t just for child Right from the cover — featuring an adorable dragon sporting classic Chuck Taylor Converses (shoelaces untied, naturally!) — readers can tell what a special treat they have in store with Duncan the Story Dragon. I LOVE IT! What an adorable story--and all about reading! With friends, too. So, so good. Can't wait to read this in storytime. Could work with mice, dragons, books, friends, solving problems. Love the pictures, too. Very cute. 1/27/16 Used in D is for theme. They really liked the story. Might have missed a couple of the "aww" parts, especially the end. But overall they still really liked it. Fall 2017: I am sure I did this in movement. After, it resided at home where my stepdaughter enjoyed havin I LOVE IT! What an adorable story--and all about reading! With friends, too. So, so good. Can't wait to read this in storytime. Could work with mice, dragons, books, friends, solving problems. Love the pictures, too. Very cute. Fall 2017: I am sure I did this in movement. After, it resided at home where my stepdaughter enjoyed having it read during our campout. Today we are going to read a book called, "Duncan, the Story Dragon". Who here likes dragons? [children raise/don't raise hands]. I like dragons too. Dragons can do something really cool when they breathe. Can anyone tell me what that is? [choose one child to answer that dragons breathe fire]. That's right! They breathe fire! Did you ever think that maybe breathing fire might cause a problem or two for a dragon? [children respond yes or no]. Hmm. . . interesting. What about this: Did you ever think that a big, scary dragon could make a tiny friend? [children respond]. Well let's find out the answers to all these questions Miss Rachel has for you this morning! [begin reading story]. One of the opening move tactics I used in this example was rasie interest in a topic or theme by asking them if they like dragons and what they know about them. I also rasied many questions throughout to spark curiosity such as asking if a scary dragon can make a tiny friend, and foreshadowed that the dragon's fire breath causes a problem for him. Alright students, what is the theme for class this week? What have we been learning a lot about? [students answer: fairytale creatures!]. That's right, kids! We sure have. Now, this morning we read a story about a princess, and there was an evil creature guarding her tower. Can anyone tell me what that creature was? [children raise hands and one answers that it was a dragon]. Exactly! A dragon. Did you know that Miss Rachel used to be very scared of dragons? They are huge and breathe fire! Well, in this story, the dragon isn't very mean, and I'm not scared of them anymore! Let's read about him and I'm sure you won't be scared of dragons anymore either. [I open the book and begin to read it]. To open this book to the audience, I would begin by telling them, "this book is named 'Duncan, the Story Dragon'. Can anyone guess what this story is about from the cover?" After having the audience discuss the question a little, I will open the book to the cover page inside the book, which has a little more to work with and point out the supplies in the picture. I'll ask, "after seeing these supplies, can anyone make any new guesses about this story? What about the milkshake, what do you think t To open this book to the audience, I would begin by telling them, "this book is named 'Duncan, the Story Dragon'. Can anyone guess what this story is about from the cover?" This is ridiculously adorable and man does this dragon have styling shoes! Love this! So cute! It makes my librarian heart happy. Duncan the story dragon is about a dragon who loves to read books. Unfortunately, from his crazy imagination he would get so excited that he would breathe fire destroying every book he read. All he wanted was to get to the end of a book. He tried his best to keep his cool but it never worked. He decided to search far and wide to find a friend to read it to him. Everyone he went up to were either scared of him or scared him. He became very discouraged and sad that he couldn’t find anyone until he Duncan the story dragon is about a dragon who loves to read books. Unfortunately, from his crazy imagination he would get so excited that he would breathe fire destroying every book he read. All he wanted was to get to the end of a book. He tried his best to keep his cool but it never worked. He decided to search far and wide to find a friend to read it to him. Everyone he went up to were either scared of him or scared him. He became very discouraged and sad that he couldn’t find anyone until he found a mouse. The mouse was very glad to read to him because he loves books. So together they were able to finish the book which was only the beginning of their friendship. I thought this book was very sweet. It was hard to not be sad for the dragon because all he wanted was to finally finish a book. It was easy to get attached to the characters. I loved how when he finds the mouse to read to him, the mouse is holding a book that says, “The Friendly Dragon” on it. This book could be used in a classroom to show the children a love for books, friendship, and determination. This book begins with the sentence: Duncan the Dragon loved to read. This is a short and easy-to-understand sentence and by using it to introduce the book is a good way to grab attention. The short statement will engage listeners to find out more about this reading dragon. 1) Raise interest about the topic: "The story we are going to be reading next is about dragons. What are some things you know about dragons from other stories, movies, tv., etc.?" (Predicted responses: they are scary, they breathe fire, they can fly people are scared of them). 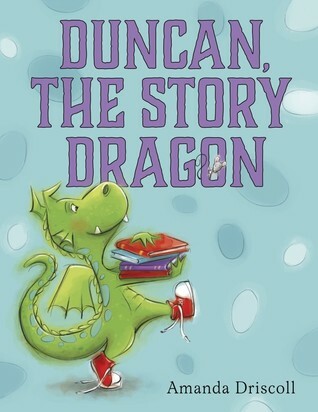 2) Prompt predictions based on the title (and cover): "'Duncan the Story Dragon'...Look at the picture on the cover. What do you think this dragon likes to do?" (Predicted response: It's a dragon that loves to read books!) 1) Raise interest about the topic: "The story we are going to be reading next is about dragons. What are some things you know about dragons from other stories, movies, tv., etc.?" (Predicted responses: they are scary, they breathe fire, they can fly people are scared of them). When I read a book, sometimes I get so interested that I just can't wait to read the ending! Every once in a while, though, I get interrupted by something and have to stop reading before I'm finished. Has that ever happened to you? How did it make you feel? In this story, a dragon named Duncan has a similar problem. What do you know about dragons? That's right, they breathe fire! They can also be kind of scary. I wonder if that will be part of Duncan's problem. -Prompt a brief When I read a book, sometimes I get so interested that I just can't wait to read the ending! Every once in a while, though, I get interrupted by something and have to stop reading before I'm finished. Has that ever happened to you? How did it make you feel? In this story, a dragon named Duncan has a similar problem. What do you know about dragons? That's right, they breathe fire! They can also be kind of scary. I wonder if that will be part of Duncan's problem. Boys and girls, raise you hand if you love to read or love to have someone read to you. I love getting to read, whether it is just reading for fun, reading for school, or even reading aloud to you. I want you to think of something that you really love to do, it may be reading, playing a sport or instrument, or anything else you can think of. How would you feel if you weren't able to do that anymore? Today, we are going to read a story about a dragon who has that very same problem. -Share a person Boys and girls, raise you hand if you love to read or love to have someone read to you. I love getting to read, whether it is just reading for fun, reading for school, or even reading aloud to you. I want you to think of something that you really love to do, it may be reading, playing a sport or instrument, or anything else you can think of. How would you feel if you weren't able to do that anymore? Today, we are going to read a story about a dragon who has that very same problem. -Share a personal connection you have with the text. 2018 Picture Book Nominee-Golden Sower Award. Duncan the Dragon loves to read books. Being a dragon poses a problem for him. Duncan breathes fire, and accidentally burns his books. In his quest to find a friend who can read to him, he meets a small mouse who loves reading as much as he does. Through the stories they read, these two friends go on epic, unforgettable adventures together. We loved this book! It's a great story about friendship and the imaginative world of reading that brought two friends together. Duncan The Story Dragon is a Duncan the Dragon loves to read books. Being a dragon poses a problem for him. Duncan breathes fire, and accidentally burns his books. In his quest to find a friend who can read to him, he meets a small mouse who loves reading as much as he does. Through the stories they read, these two friends go on epic, unforgettable adventures together. We loved this book! It's a great story about friendship and the imaginative world of reading that brought two friends together. Duncan The Story Dragon is a must have for any children's picture book reader. With adorable, colorful illustrations that capture the magic of reading, this is the perfect book for story time, and bedtime reading. Such a fun read aloud book with a lovable dragon for a main character. Kids will delight in the idea of a dragon who loves to read but can't finish a book because it burns up from the fire he breathes when engrossed in a story. When Duncan finds help from the most unlikely of sidekicks, readers discover the power of learning to read. This is one of those books kids will ask parents to read over and over again. And parents will enjoy re-reading it just as much as the kids. Duncan's dream of finishing a story before he sets it on fire leads him to a new friendship and a happy ending. The illustrations of this adorable creature lure your heart into Duncan's quest. I love this brave soul who finds a way to make his dream come true. I am in love with Duncan! I cannot imagine being unable to finish a book and, to make matters worse, not being able to find anyone to read it to me. This is an adorable story that I will definitely be sharing with all my classes! I absolutely loved this book and so did the preschoolers I read it to. The poor little dragon just wants to finish a book! First, I will sit down in a reading corner that I presume will be in my classroom. I will have all the children sit down on the rug and sit quietly in preparation for the story time. I am going to assume this is the first story time I have ever had with this group of students. I will start by saying “Who here knows what an author is?” they will all raise their hands and I will choose someone. Once somebody answers and gives an answer saying something like “Someone who writes books.” I will continue saying “Who here has heard of the author Amanda Driscoll?” Once the children all put their hands down I will [grab the book and put it on my lap, showing the cover to the children] then I will proceed in saying “Here is her book, Duncan The Story Dragon”. Once the children all quiet down from probably ‘oohing’ and ‘ahhing’ at the cover I will present them with my next question [while opening the book to the first page] This page has Duncan the Dragon sitting reading a book. I will then say, “How many of you love to read?” I will then say, “How many of you love to read with your friends?”. The book is about a little dragon who can’t read on his own because he destroys the books. I will then continue to say “Well, Duncan likes to read with friends too! He just can’t read alone. Do any of you have guesses why he can’t read books alone?” Once I hear all of their answers I will turn to the next page and start to read the book to the class. "Duncan, the Story Dragon" by Amanda Driscoll is the story of a young dragon named Duncan who loves to read books. Unfortunately, when Duncan starts imagining his stories, he accidentally lights them on fire. He tries his hardest to keep calm while reading but it doesn't work. He is never able to read the end of his books. He wants to meet a person who can read his stories for him. He is able to meet a mouse who also shares his passion for reading. Together they are able to go on many adventures "Duncan, the Story Dragon" by Amanda Driscoll is the story of a young dragon named Duncan who loves to read books. Unfortunately, when Duncan starts imagining his stories, he accidentally lights them on fire. He tries his hardest to keep calm while reading but it doesn't work. He is never able to read the end of his books. He wants to meet a person who can read his stories for him. He is able to meet a mouse who also shares his passion for reading. Together they are able to go on many adventures by reading the many books they both enjoy. Duncan The Story Dragon, written and illustrated by Amanda Driscoll, is the perfect read aloud for any classroom of students from grades 1-3. The story is a funny tale of Duncan, who is a dragon that loves to read, but unfortunately his books catch fire with his imagination. He comes across many animals, but every animal he asks won't read it to him, except for a teeny tiny mouse. They read the story together, which allows their imaginations to fly together. This story is perfect for young child Duncan The Story Dragon, written and illustrated by Amanda Driscoll, is the perfect read aloud for any classroom of students from grades 1-3. The story is a funny tale of Duncan, who is a dragon that loves to read, but unfortunately his books catch fire with his imagination. He comes across many animals, but every animal he asks won't read it to him, except for a teeny tiny mouse. They read the story together, which allows their imaginations to fly together. An absolutely charming story with absolutely adorable art, about a book-loving dragon named Duncan. Duncan just wants to finish a book, but every time he reads he gets so excited he accidentally sets his book on fire, and never gets to read "The end." So Duncan goes on a quest to find a friend who will read to him. 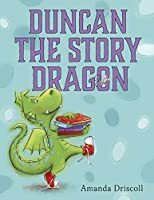 After a succession of animals who avoid his request in humorous ways, he finally finds a fellow book lover brave enough to read to him, and together they enjoy books all the way to th An absolutely charming story with absolutely adorable art, about a book-loving dragon named Duncan. Duncan just wants to finish a book, but every time he reads he gets so excited he accidentally sets his book on fire, and never gets to read "The end." So Duncan goes on a quest to find a friend who will read to him. After a succession of animals who avoid his request in humorous ways, he finally finds a fellow book lover brave enough to read to him, and together they enjoy books all the way to the end....carefully. There's a clunky line about the end of a book being like the "last sip of a chocolate milk shake" that was surprisingly difficult to read aloud smoothly, but otherwise I felt that the art and story flowed and complimented each other wonderfully. Duncan is a kind, gentle dragon who just wants to read a story, and actually finish one. "His imagination caught fire," along with his book. He tried everything he could think of to keep his cool, but then he had a bright idea. What if he had a friend to read to him? Will he find a friend to see past their fear of the dragon and be willing to help? This is a charming story of fortitude, books, friendship and don't forget, milkshakes. * Bring in mini milkshakes for the students to enjoy after the lesson. Do an art project with the students. Use toilet paper rolls, pom poms, googly eyes, and tissue paper to make a dragon. The students can color or paint the toilet paper roll green then add pom poms and googly eyes for the eyes and tissue paper for the fire coming out of the mouth. These will be a blast to make and the students will enjoy showing them off. You can even hang them in the classroom. Duncan is a dragon that loves to read. He gets super duper excited and his imagination goes wild and he accidentally blows some fire. This ends up burning his books up and he never manages to finish a book. He'd gone and asked a few critters if they could read the book for him, but being a dragon, he sort of spooked them. When things look bleak he meets a small mouse, and seeing as they both love books the mouse is more than happy to read the stories to him. Together they go on grand adventures Duncan is a dragon that loves to read. He gets super duper excited and his imagination goes wild and he accidentally blows some fire. This ends up burning his books up and he never manages to finish a book. He'd gone and asked a few critters if they could read the book for him, but being a dragon, he sort of spooked them. When things look bleak he meets a small mouse, and seeing as they both love books the mouse is more than happy to read the stories to him. Together they go on grand adventures with each new book, making sure to take some breaks for snacks when Duncan gets too excited. 3/10/2018 ~~ This is on the list of Young Hoosier nominees in the Picture Book category. I adored reading it aloud this week (preK to 3rd). The word choices are impeccable and demonstrate how carefully picture books are crafted. Did you notice that pattern of "would you, could you?" Duncan to raccoon: "Would you read this book to me?" Duncan to possum: "Could you read this book to me?" Duncan to bull: "Will you read this book to me?" Duncan to mouse: "Would you, could you, will you please read this 3/10/2018 ~~ This is on the list of Young Hoosier nominees in the Picture Book category. I adored reading it aloud this week (preK to 3rd). The word choices are impeccable and demonstrate how carefully picture books are crafted. Did you notice that pattern of "would you, could you?" I was delighted when my 2nd graders in two different classes noticed the homage and similarity to the phrasing in Green Eggs and Ham. This bright, warm tale champions determination, A charming story about the joys of reading that is perfect for fans of Dog Loves Books and Stellaluna. Just like the last sip of a chocolate milkshake, children will love the book Duncan the Story Dragon. Duncan the dragon, a huge reader, has a problem. No matter what he tries, he cannot keep his imagination and books from catching fire while he reads. Follow Duncan as he searches for a solution to his problem and the joy of finally reading the last line of a story. Parents and children will LOVE this cute story about how important it is to find friends who read.